If FileThis is your document destination, you can quickly upload documents by emailing them to your FileThis account. This is particularly convenient when forwarding documents you receive via email. If the email itself is the document—as is the case with an emailed receipt—you can simply forward the email to your account. When you upload documents in this manner, you can specify the cabinet and tags for the documents as well. Note: FileThis accepts files in PDF, Word, Excel, and PowerPoint formats (indicated by pdf, doc, docx, xls, xlsx, ppt, and pptx file extensions) and images in JPEG, TIFF, Bitmap, GIF, Pict, PNG, and Photoshop format (jpg, tiff, bmp, gif, pct, png, and psd). When emailing documents to your account, use the “m.filethis.com” email address assigned to you. To see this email address, login to your account from a browser and click the Upload tab. The email address is shown at right under Other Ways to Add Documents. 1. Create a new email. 2. Address the email according to your upload email address shown in the FileThis Account Settings dialog box. 3. Attach the documents to the email. 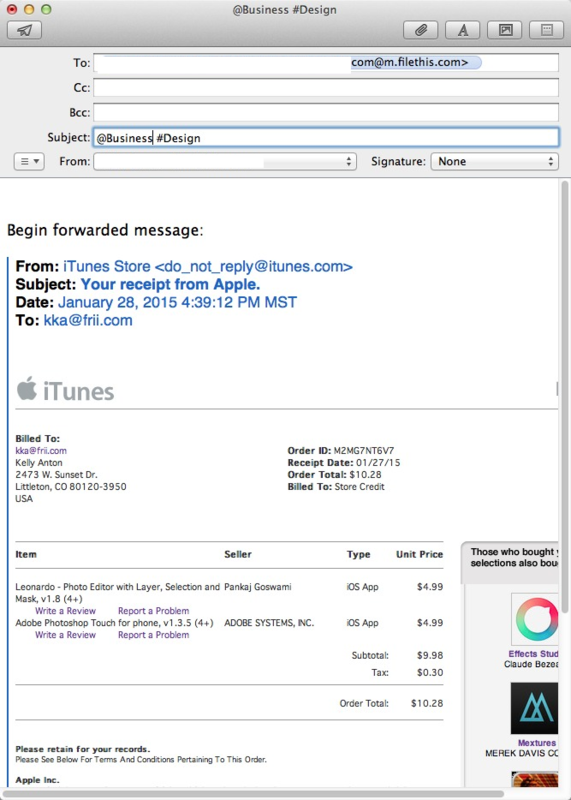 If the email is the document, as is the case with iTunes receipts, you can simply forward the email. When you email documents to your FileThis account, you can specify a cabinet and tags for the documents. The cabinets and tags you specify will override FileThis’ attempt to select a cabinet and apply tags based on content. Specifying a Cabinet for Emailed Documents: When you email documents to your account, you can specify an existing cabinet to put all of them in. To do this, type the cabinet name in the email’s subject line, preceded by an @ symbol. For example, @Home as an email’s subject line places all the attached documents in the Home cabinet. Tip: You can include a standard subject line in the email, then specify a cabinet with the @ symbol. FileThis will ignore text prior to the first @. Specifying Tags for Emailed Documents: You can also apply an existing tag to all the attachments in an email. To do this, type the tag name in the email’s subject line, preceded by a # sign. For example, #Appliances applies the Appliances tag to all the attached documents. You can apply multiple tags by including another # sign. For example, #Appliances #Kitchen applies both the Appliances and Kitchen tags to the documents. Specifying a Cabinet and Tags for Emailed Documents: As you email documents to your account, you can put them in a cabinet and apply tags at the same time. For example, if you have a receipt you want to place in the Home cabinet with both the Appliances and Kitchen tags, you use: @Home #Appliances #Kitchen. The email shown below sends a copy of an Apple Store receipt received via email to the Business cabinet and assigns it the Design tag. This will make the document easy to find at tax time.